As a sports fan, you sometimes run into this weird politeness you usually only encounter when talking about politics with extended relatives. You don’t express your true beliefs, you couch your words carefully as not to come off as arrogant or rude, and you certainly don’t make proclamations. You often find yourself not lying about your beliefs, but also not being completely honest either. You will feign weakness when you truly feel strong. Rivalry weeks when the outcome is unsure for either side of the field. I feigned humility. I did it on this very site, pretending to feel only a modicum of hope on Thursday and worrying about Bruce Arians on Friday. Maybe I was worried about a jinx saying I felt good about the game or worse, stupid if I came out and said I thought the Steelers would win against the Patriots. Is it pouring salt into the wound to say I thought the team was going to win only after they won? I bring this up because it’s Steelers-Ravens week and I am truly terrified, and because now the Patriots have every reason to blow the Steelers out if they face each other in the playoffs. So if you hear me say over the next few days, “I’m really worried about this game,” know that I really mean it. While great in a bar, mozzarella sticks are a ton more work when you’re at home. First, you have to make sure you get a good mozzarella that will hold up to frying. Then you have to bread them. Then fry them with a ton of oil, or worse, try to bake them in the oven where they inevitably melt into goo. Then they pretty much only taste like whatever marinara or ranch you pair them with for snacking. A lot of work for very little reward. Which is why my favorite fried cheesy snack to make at home is queso blanco. Queso blanco is a type of farmers cheese with a very, very moisture content that unlike most cheeses, does not melt or string when heated. It becomes soft on the inside while developing a nice crusty shell on the outside without any sort coating on it whatsoever. When you bite into seared queso blanco, it squeaks like a fresh cheese curd and rewards you with a buttery creaminess found in only some the best mild cheeses. Plus, it only takes about five minutes to make. When buying queso blanco, make sure you are buying, well, queso blanco. Often in here in the US you will find the term queso fresco mistakenly used in place of queso blanco — including by such institutions as Bon Appetit, who should really know better — when they really are quite different cheeses. 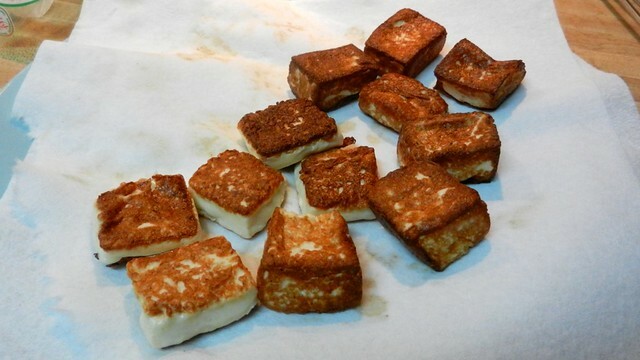 Queso fresco, while also being a cheese that does not fully melt, has a higher moisture content and instead of getting nice crust when heated, becomes a soft puddle of cheese in the pan. Queso fresco easily crumbles while queso blanco is a very firm cheese, as seen in the picture below, so if you’re not entirely sure your cheese monger has the correct label in the case, ask for a sample to feel for water content and firmness. This is not to queso fresco is a bad cheese. No, I love it. Have a recipe that uses it and chiles planned for later in the season. It just doesn’t work here. The only other cheese that can be used instead of queso blanco for this task is queso para freir, a cheese often associated with Puerto Rican cooking and in my experience, really hard to find. 1 pound is pictured here since I bought enough for snacks a couple of different nights during the World Series. 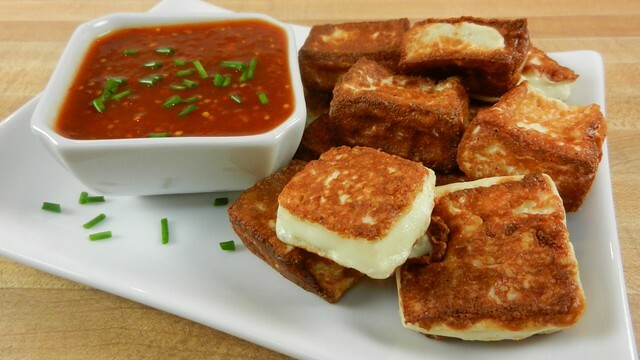 But go ahead, make a whole pound of fried cheese at once. I’m not going to stop you. Why is vegetable oil optional? If you’re searing the cheese in a non-stick pan, you really don’t need it. 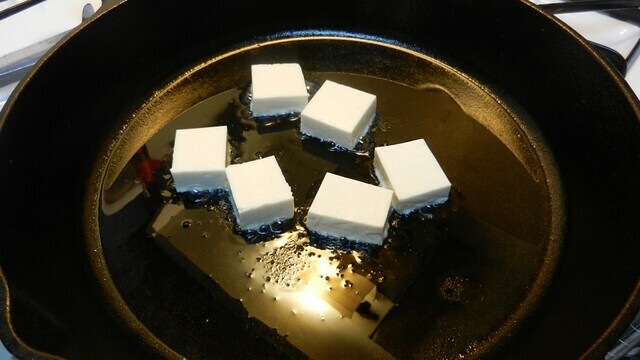 Since I heat this cheese in my cast iron skillet, I use about half a tablespoon of oil. 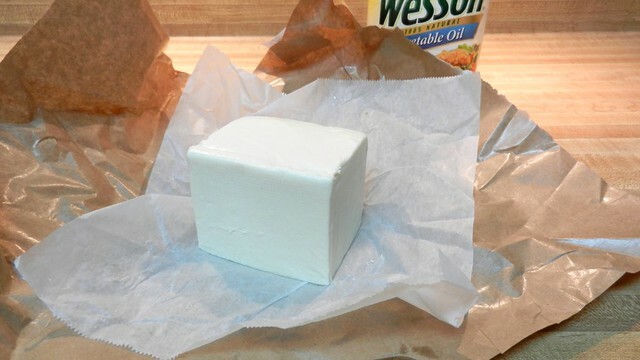 Cut the queso blanco into squares. Heat the pan to medium-high and sear the queso blanco for a minute or so on each side. Turn as each side browns. Don’t worry if you don’t quite get all the edges, it’s hard to do. Serve with your favorite taqueria type salsa for dipping. The mildly salty cheese holds up well against spicy chipotle and chili salsas, while providing a nice balance to the heat. Studley’s jumped out to a whopping seven-point lead in the CFB Football Foodie Pick’em Pool, while Skippy Reed continues to hold on to her one point lead over Pretty Girls and Waffles in the NFL Football Foodie Pick’em Pool. Competition is so tight in the NFL pool, it’s only a couple of points difference between first and tenth place, so that lead could break any which way over the next few weeks. Heat the pan to medium-high (with oil if required) and sear the queso blanco. Turn as each side browns. Don't worry if you don't quite get all the edges, it's hard to do. 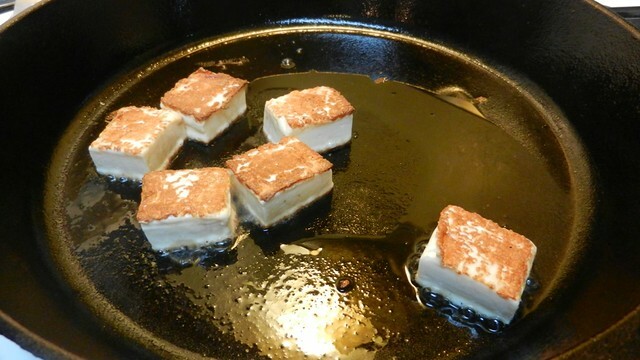 If using a non-stick pan, oil is not needed. These look so good! Remind me of the queso frito my mom used to prepare for breakfast as treats: http://www.dominicanflave.com/i//queso_frito_1.jpg (the mashed next to it is mangu, mashed plantains). You have no idea how hard I’ve tried to find queso para freir in LA. One restaurant supply store out here said they could possibly order it for me, but I’d have to order ten pounds at a time. How does your mom make it? Just in a bare pan or with some oil? She cuts it so they’re shaped like cheese slices, like the kind you put in sandwiches. Then she turns them over in some flour and fries them in a pan with a little oil. Hmm. Next time I’m going to try flour then and see what happens. I’ve seen people call for cornstarch for searing the cheese, but I’ve never tried it myself. I learned to do it with just a bit of oil or nothing at all a long time ago. RESSALTANDO, QUE NESSE PROCESSO ACIMA, O ADVOGADO DO HOSPITAL BINÃ‰ SOARES NADA MAIS Ã‰ QUE O ADV. EDER E O DA PREFEITURA NADA MAIS Ã‰ QUE O ADV. RONALDO HENRIQUE SANTOS RIRAMRO.LEIBBENDO QUE O ADVOGADO RONALDO Ã‰ O MESMO QUE ESTÃ DEFENDENDO NA JUSTIÃ‡A O CERTAME DE PRESIDENTE DUTRA.AbraÃ§os. Yummy thanks for posting this. The cheese was outstanding but your salsa looks so delicious, is there a recipe for it? I think I may have cheated in these shots and used salsa from my local ethnic market. 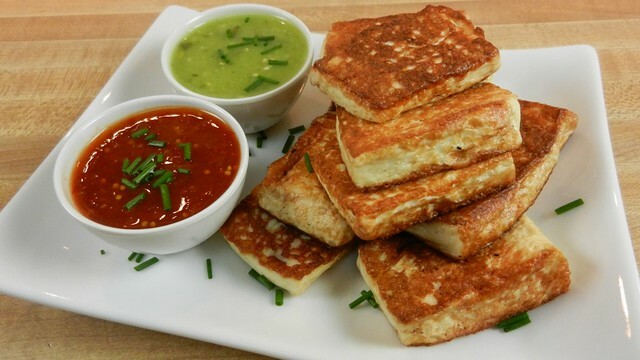 thank you soo much for fried Queso Blanco recipe. i love your cheese. I tried to make it, and the cheese stuck to the pan and when it would brown, the browned part stuck and i could never get it to do right. I put it in the garbage disposal. How do I keep it from sticking?